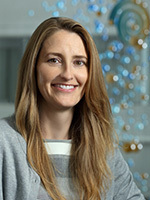 Kristin Riekert, PhD, is an associate professor of medicine at John Hopkins University. She is also director of the university’s Cystic Fibrosis Adherence Program and the Johns Hopkins Adherence Research Center (JHARC). After completing a doctoral degree in clinical psychology, she did a fellowship in their Division of Pulmonary and Critical Care Medicine, and soon after, was brought on as an instructor. She has been a researcher at Johns Hopkins ever since. Dr. Riekert’s introduction to medicine was through personal circumstances. Her older sister was born with congenital heart defects, and the family spent a lot of time in hospitals. She decided to train as a psychologist because she liked to ask “why.” Pediatric psychology and the intersection of behavioral and physical health became her specialty. Her interest in treatment adherence arose early in graduate school, when she spent hours transcribing interviews of mothers of children with cystic fibrosis. The mothers recognized that adolescence was a time when adherence decreased and expressed angst about how to help their child become more responsible for their own care. In her 25-year career, some of the greatest advances have been on the technology side. Bluetooth monitoring devices and mobile health, or mHealth, technology, are gaining momentum. Dr. Riekert sees great potential for technology, devices, and apps to revolutionize how we provide cost-effective and personalized support to patients, delivering the right amount of treatments to maintain health. She and her team are actively working on innovative and adaptive adherence promotion strategies using mHealth platforms. They believe self-management models, where patients can sustain their daily care, are on the horizon and soon will be the way of the future. In additional to leading several clinical trials, Dr. Riekert is co-chair of the Cystic Fibrosis Foundation-funded Success with Therapies Research Consortium. According to Gregory Sawicki, MD, MPH, director, Cystic Fibrosis Center and assistant professor of Pediatrics, Harvard Medical School, “Dr. Riekert is a thoughtful and enthusiastic colleague. Her passion for executing high-quality and high-impact research to improve the lives of patients with cystic fibrosis is a motivating force in the consortium.” The group includes 22 pediatric and adult care centers across the U.S., pulmonologists, psychologists, pharmacists, a health economist and, perhaps most importantly, patients and families, all working to improve day-to-day adherence for individuals with CF. A vision 10 years in the making, the consortium is now conducting several studies that are pragmatic and, if efficacious, have the potential to quickly be disseminated into regular clinical care. Dr. Riekert has held many leadership positions in the Society, including serving on the ATS Board of Directors while chair of the Assembly on Behavioral Science and Health Services Research (BSHSR). When not obsessing in the laboratory about research design or data sets, meeting with mentees, or thinking of new ways to improve adherence, Dr. Riekert can be found on the athletic field or driving the minivan carpool. She is a mother to two teenage, soccer-playing boys. The family, which includes a dog, is very active, often enjoying long hikes in the woods.